Well, I guess the admiral has been promoted. I’ve been fussing with sail trim and wind angles and I can get the boat to do 8 knots in 9 knots of wind, which is a sweet spot for her. I took a few pictures to give you a taste of what that really means, in terms of the speed of the boat through the water. When the designer calls this a “performance cruising catamaran,” he’s not kidding. Usually this kind of performance is associated with stripped-down racing boats, the kind where the head is a bucket, there’s no galley to speak of, and it’s filled with strong men with tan faces and the singular determination to win. In our case, we have all the luxuries of home – including a workshop and a full kitchen – and yes, two normal toilets and two double berths. And a very comfortable “living room.” It’s a very dignified, dry existence as the boat speeds on its way. There’s none of that “spray in your face” experience one normally associates with this kind of speed. Of course, everything comes with its own tradeoffs. We’re currently aiming for a tiny island in the middle of a big ocean, and to get there fast – given the wind direction – we must go more northerly than we would like. So now we are even with the island from a north/south point of view, and the island is just to the west of us. Time to jibe the boat and get going in a westerly direction. At the rate we’re going, we could arrive there during the night, which we wanted to avoid. So it may be time to slow the boat down a little. Maybe pull down the big sail and just use the plain old jib. As soon as Philip is vertical (it’s his afternoon rest time), we’ll discuss all this and decide what to do. At the rate we are going, we should get to St Helena tomorrow. It’s about 100 miles away. 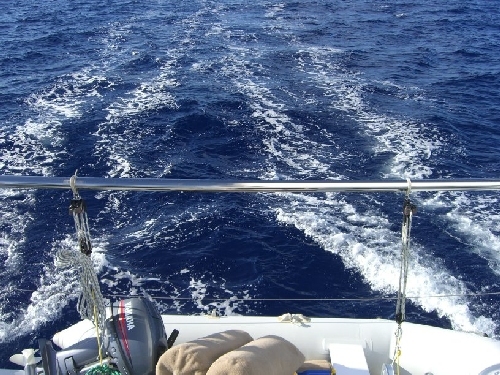 We are going to stick with the Code Zero sail for now; we can always slow down when we get closer to the island. Ethel asked if we are listening to the radio, or using an iPod, or surfing the Web. The answer is “no,” in all cases. I do have an iPod, but right now hearing the boat is more important than music, so that’s out. We have no TV on board, and the only thing we’d be watching would be Formula 1 races anyway. I should be able to surf the Web with the sat phone, but so far the only site that has come up consistently is my own. So much for finding out what the world is up to. I’ll probably get a summary from someone who might be interested in providing it. I think God really does want me to get the book done, without the distraction of the latest disaster. So far it’s been quite pleasant writing during my night watch. The garden also had aphids; they’re less easy to find than the big, fat caterpillars, but they can also be squished easily. The plants are making a valiant effort to be healthy in spite of these hardships, and I think we’ll end up with most of the garden surviving once we get past this rough patch. …It’s now 4:40AM St Helena time, and I just spotted the lights on the island, to the west of us. 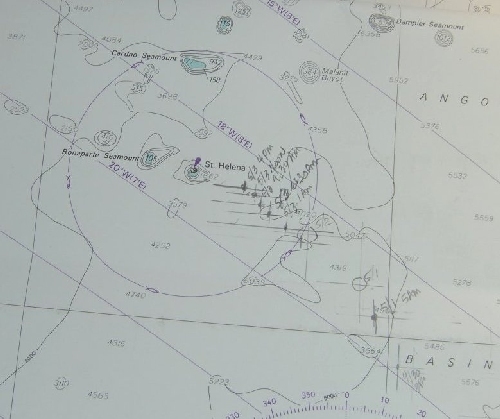 Because of the wind and current, we will go north of the island and then south to get to the island. We will do that in daylight. We’ve been marking our progress on the chart, all along, on this trip. As you can see, the slower you go, the closer together the marks are. The wind died to almost nothing as we got closer to the island. We finally had to resort to using the engines, just to make sure we got there before sunset. P.S. 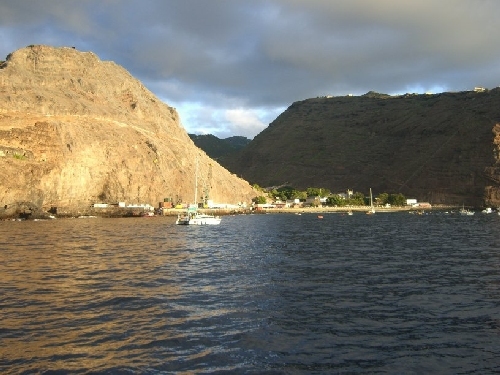 We did stop in St Helena after all, and took lots of pictures, which will appear in the next update. 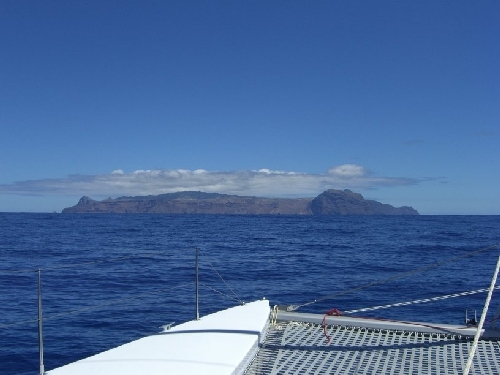 But here are a couple of shots of St Helena, taken as we approached the island. To reach the tiny town of Jamestown, we will be going around to the right of the island (as you look at this shot). Here’s the “anchorage” – which is really just an unprotected harbor in the sea swell. Jamestown is just beyond the sea wall, nestled in between those high cliffs. We got there just as the sun was setting. Magical.